Washington voters, communities and businesses are demanding strong and effective action on climate pollution. But how would a ballot initiative accomplish that? Here are some of the details of the initiative that a diverse coalition including The Nature Conservancy has filed. The initiative is being called Protect Washington because it aims to create a cleaner, safer and healthier world for all of us by reducing pollution and addressing its negative impacts. It would create a pool to be used to accelerate our state’s transition to clean energy, increase the resiliency of the state’s waters and forests to the impacts of climate change and reduce the impacts of climate change on communities. Another 25 percent would be slated to clean water and forests, increasing their resiliency to the impacts of climate change. This could include restoring estuaries and fisheries, preparing for sea-level rise, treating stormwater and improving resilience to wildfires in our forests. The last 5 percent would go to healthy communities to help them prepare for the challenges caused by climate change and to make sure the impacts of climate change are not disproportionately borne by certain populations. Additionally, the initiative would require that at least 10 percent of all projects be endorsed by the governing body of a federally recognized tribe. How will we pay for all this amazing work? A pollution-reduction fee would be levied on large emitters based on the carbon content of fossil fuels and carbon-sourced electricity. Beginning Jan. 1, 2020, the fee is equal to $15 per metric ton of carbon content. Beginning Jan. 1, 2021, the fee increases by $2 per year until the state’s 2035 greenhouse-gas-reduction goal is met and the state’s emissions are on a trajectory that indicates that compliance with the state’s 2050 goal is likely. In order to prevent sources of pollution and the jobs they support from simply leaving the state, fossil fuel and electricity sold to and used by energy-intensive and trade-exposed businesses will be exempt from the fee. 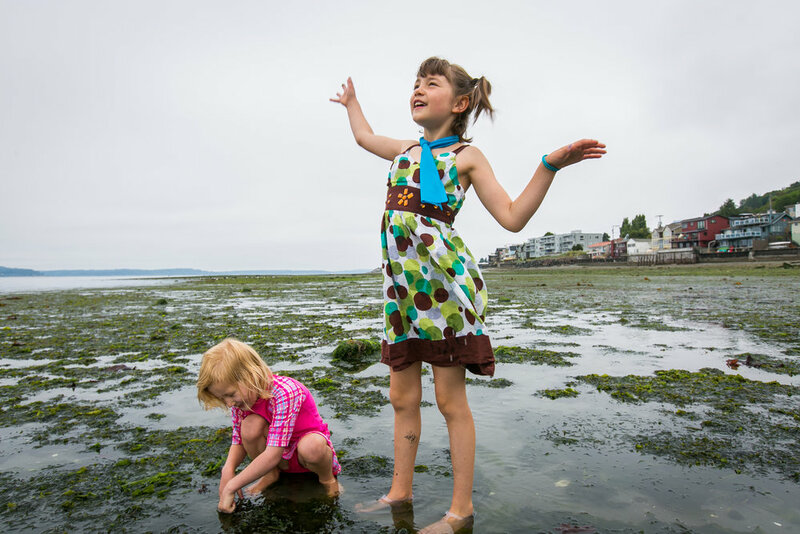 Children enjoy low tide on Alki Beach in West Seattle. Photo by Paul Joseph Brown. We know carbon pollution is damaging our health and some communities are being highly impacted. To that end, the state Department of Health would be charged with designating pollution and health-action areas. At least 35 percent of state expenditures would be used for investments that provide direct, meaningful and ensured benefits to pollution and health-action areas with a minimum of 10 percent of state expenditures being located in these communities. To make sure this is done right, a public oversight board would oversee the implementation of this initiative, supported by investment panels that recommend effective, efficient investments to meet the goals of the initiative. This is a bold initiative that would shape a better future for all of us in Washington while modeling a path forward for the rest of the country. Sign up below to learn more and, get involved to be part of history.